Hands up who likes February? (Northern hemisphere only). I don’t see many hands! Traditionally February is seen as a dreary month, isn’t it? The end of year festivities are well and truly over, January resolutions are already beginning to drop by the wayside and the novelty of snuggling up and bunkering down for winter has worn thin. Spring still seems a long way off and the weather is terrible. If this is sounds familiar then what you need is a great big dose of Mediterranean colour. And February on the Côte d’Azur has it in abundance. This month is all about, not one, not two but three of the most colourful festivals you can imagine: Nice Carnival, the Menton Lemon Festival and the Mandelieu Mimosa Festival. Spring comes early to the French Riviera; the sun shines a little stronger each day in the deep blue sky, ripening lemons, oranges, mimosa and many other flowers in time for carnival. Menton has the most hours of sunshine per annum in France creating such a perfect climate for growing citrus fruit that at the beginning of the twentieth century it was the principal producer of lemons in Europe. So, what do you do if you’re a hotelier in the 1920s with a glut of lemons? You put on a lemon exhibition. This exhibition was so successful that the town council took on the idea and by 1934 the “Fête du Citron” was born. This carnivalesque celebration of oranges and lemons, lasting two weeks coinciding with, and complementing, its bigger neighbour, the Carnaval de Nice, has been running every year since. 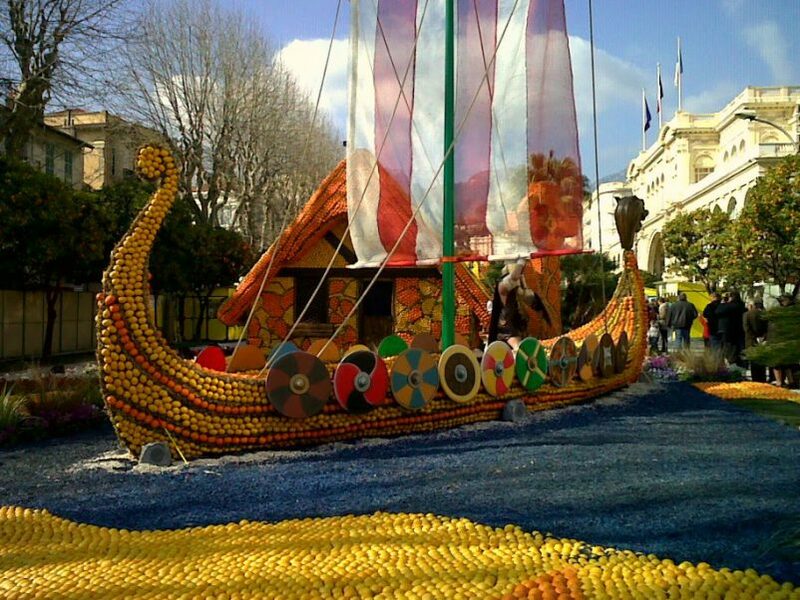 The Menton Fête du Citron consists of two separate sections – an exhibition in the central park, les jardins Biovès, of detailed, intricate structures made out of oranges and lemons along the year’s theme, and a series of carnival parades around the town. These parades feature large floats decorated with oranges and lemons in the particular theme of the fête interspersed with musical bands, dancers, folk groups and street entertainers. Themes over the past few years have included “Regions of France”, “Around the world in 80 days”, “Cinema”, “Alice in Wonderland”, “World Music” “India”, “China” and “20,000 leagues under the sea”. The exhibition is open every day for the entirety of the festival while the parades take place a couple of times a week. Every year it runs for just over 2 weeks from mid February to early March. You can check here for dates and times, and to book on line. To create these unusual and highly original citrus structures approximately 1,000,000 rubber bands are used to hold 120 tonnes of fruit in place! The Fête du Citron is a fabulously bright and cheerful festival that against the backdrop of bright azure sea in one direction and the mountains in the other can’t fail to lift the spirits. It’s just a little bit oddball, particularly in contrast to the conservative bourgeois reputation that Menton, a rich retirement town, has. Having said that Menton is, actually, a gorgeous place with a lovely old town, elegant boulevards, a delightful market hall, a pretty fort and a stunning new museum dedicated to Jean Cocteau among other sites. It’s well worth a visit, carnival or not. And in case you’re wondering what happens to all that fruit at the end of the two weeks, around 90% of it is still in good enough condition to be eaten, so it’s sold off locally at bargain prices! Have you ever been to an unusual carnival? Do you have a favourite one? I’d love to hear about other spring festivities around the world. Do tell!! 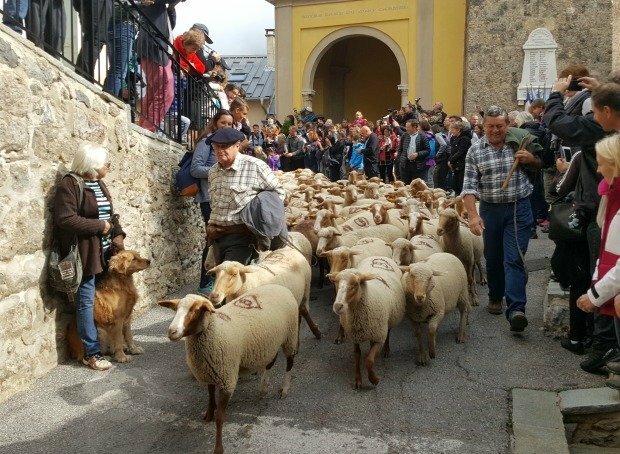 You might enjoy reading about these other colourful, fragrant spring festivals on the Côte d’Azur: Orange Festival and Rose Festival. It’s very cheery, can’t help but smile really. 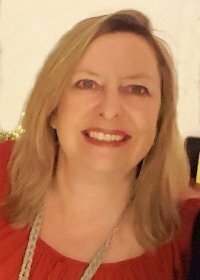 You must come and stay next Feb half term Clare! Exactly Cathy, yellow is sunshine! I’m not sure lemon festivals (plural) are a thing, but this one is pretty special! The fête des lumières is the world’s 3rd biggest festival so if you can handle those crowds I reckon you’ll be fine in Menton! Yes I imagine Ireland is a little grey right now. I like January because in France we keep on celebrating with galette des rois – king cake – throughout the month! Yes, it would be a terrible shame if they were just dumped. It’s amazingly unheard-of out of this immediate area Lyn. Wow! I didn’t know lemon festivals were a thing! So cool to see all the ‘sculptures’ they can decorate with lemons and oranges! Book yourself a little trip over here this year, we’ve get dates available Lolo!!! What a shame Trish, it’s a pretty big event but nothing like as well known as carnival. You’ll just have to come back again soon! The theme this year is Broadway, I’m looking forward to it, should be some good structures and floats. 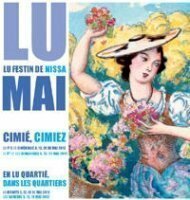 We spent time in Nice for the carnival many years ago but I didn’t realise the Lemon Festival was on at the same time! I missed a trick, especially as we did venture out on the train along the coast on one of the days. It looks fabulous. What can I say? That’s a lot of lemons! I thought you were going to say they made lemonade at the end of the festival rather than sold it off 🙂 Well there’s nowt so strange as folk…..
It’s such a colourful and fun antidote to the dull month of February. It’s really fun to photograph Bob, you should come over one year, it’s not so far from Ljubljana. I heard about this from friends who live in Menton! Never been to the fete, but would be great to check it out. Looks like a fun event to photograph. What a fabulously unique carnival – I love the ideas and the colours are so vibrant! Thanks for linking to #TravelAtHome. It is fun Frank and not so so far from Croatia…. Thanks for hosting Ashley! Look out fo rmore link ups now that I’ve found you! You are so right about February being a dreary month! Never heard of the Fête du Citron. But it certainly sounds like a lot of fun. Amazing floats and structures decorated with oranges and lemons! It’s going onto my bucket list :). Thanks for linking up to the #SundayTraveler. Fab, I’m glad you found this post then! Oh my, I can’t stop looking at these pictures. Those creations are so amazing! My husband happens to love lemons, so we’ll definitely put this on our bucket list. That’s great Molly, enjoy carnival and come back next year for the lemons! Wow- this is both totally ridiculous and amazing! Had never even heard of the festival before, so thanks. 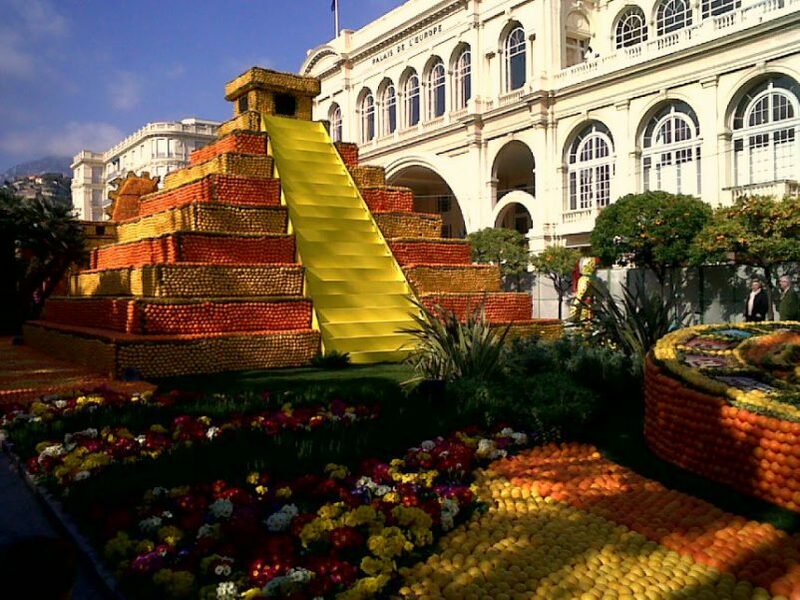 I’m going to Nice for the end of the carnival this year, but sadly will miss the lemon festival – one for next year! I love the region so much – this will be my third visit and I’m still discovering new things to do :). Can’t wait to go! Yes you must make it one day Cheryl, it’s really beautiful. That looks amazing! Reminds me of the New Years Rose Parade. Looks fantastic! I really must visit it one year. Until a couple of years ago I only knew about the Nice Carnival. Sounds like I should put the Rose Parade on my list of events to see! I’m so glad you’re inspired to visit this area, I hope you make it one day. The Fete du Citron looks amazing! Like another commenter, it immediately reminded me of the Rose Parade in the U.S… where all the floats are decorated in flower petals, seeds, and leaves. I’d never heard of the Fete du Citron before, and now I’ve got another place on my list to visit! It looks like a perfectly sunny remedy to February! Thanks always for commenting Lisa! Another great post! I feel as if I’m there! Thanks as always for the great pictures. Thanks for popping by Tisha, I’ll be sure to check yours out too. It sounds like you have similar weather to us Jackcyn. The rose parade sounds fun. You’ve summed it up perfectly Chrissie – Feb in the northern hemisphere = yuck, Feb in the southern hemisphere on the other hand = lovely. Hope you’re enjoying your trip back “home”. “Profites” as they say here, it’s still raining! Wow! I’ve never heard of this. Very cool! It is usually raining and dreary here in Northern California during the month of February, so a fun citrus festival would be a welcome distraction. On New Years Day Pasadena holds its annual Rose Parade – horses, marching bands and lots of creative floats covered entirely of flowers and plant materials. It’s a lot of fun to watch on TV although I’ve never attended in person. 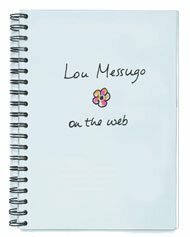 Why are we not staying at Lou messugo during the lemon festival? We will next year for sure.